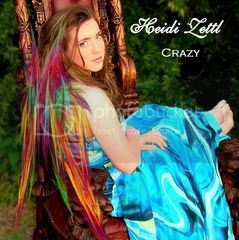 Arlington born Heidi Zettl has released her newest single, “Crazy,” to broad acclaim. The track combines the complexity of classical composition with the radical overtones of modern rock 'n' roll to create a sound that is both intellectually intriguing and emotionally charged. The melodies are mostly carried by Zettl, herself, whose whirling vocals showcase an earnest rawness that contrasts perfectly against her delicate piano playing. Her style of singing is not unlike that of Dolores O'Riordan of The Cranberries, except that Zettl boasts a broader range than O'Riordan, perhaps, and is even more fearless at the writing table, where she never balks at including a particularly difficult measure, or an entirely unexpected chord progression. “Crazy” is a single full of power and beauty, two attributes that are increasingly difficult to find in today's polarized and ever more pigeonholed music industry. Whether her math scores jumped a couple notches or not, the benefit to her music writing skill is plain to be seen. While “Crazy” can be described as pop rock, it is far more involved than the radio's typical top 40 fare, and should give veteran music listeners more than enough to chew on for a single. Heidi Zettl is a voice to watch out for, and her single, “Crazy,” is not one to be missed.